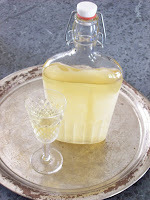 Napa Farmhouse 1885™: at long last...the limoncello is finished!!! I started my batch about a week after yours, so I am ready for the bottling too. I can't wait to try this as I have never had Limoncello before. Your description made it irresistible! Thank you for your wonderful blog. I will let you know how mine turns out. 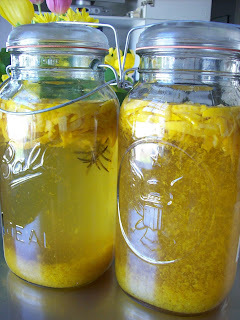 I made the Limoncello too! And I found the Meyer lemons. I will finish the recipe this weekend and let you know how it turned out. My friends are questioning the Rosemary ?? ?, but I trust you so I added it. I know it will be good. Oh wow...This looks amazing! I'm going to have to try making some. It really looks fabulous! 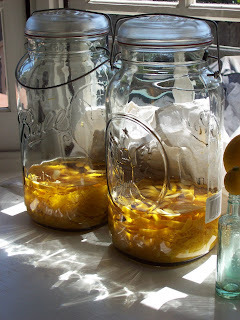 So right now we have about 1.5 l of Buddha's Hand-cello on hand (so to speak) and another batch of pompelmo-limoncello (grapefruit and lemon) in the infusion phase. My pompelmocello from last year was a great success. 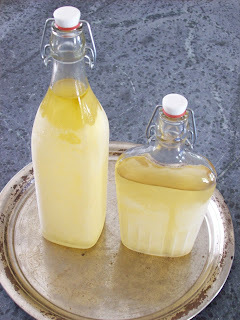 Our friends at Married... with Dinner have done bergamotcello, and that's really interesting. Fun to play with variations! You've inspired me to break into my own batch over Memorial Day weekend. Actually, I'll probably test my batch this weekend, since we're in for some piping hot weather! thanks sean...you have totally inspired me! i have thought about making "orancello"... with the mandarin oranges from my tree...but the grapefruit one sounds delicious...and the bergamont...man...how fun to keep experimenting with various fruit and herb combinations! 90's this weekend so...napa farmer's market for fresh produce? check...sunscreen? 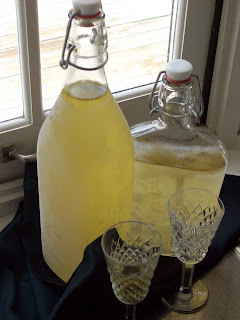 check...ice cold limoncello? check...pool..here we come!! I hope your limoncello is sinfully delicious-nothing better on a summer evening, except limoncello cheesecake to go with it! can't wait to get to know your blog..
great site...I'm in the process of moving my family from England to Napa so this site is a rare treat.